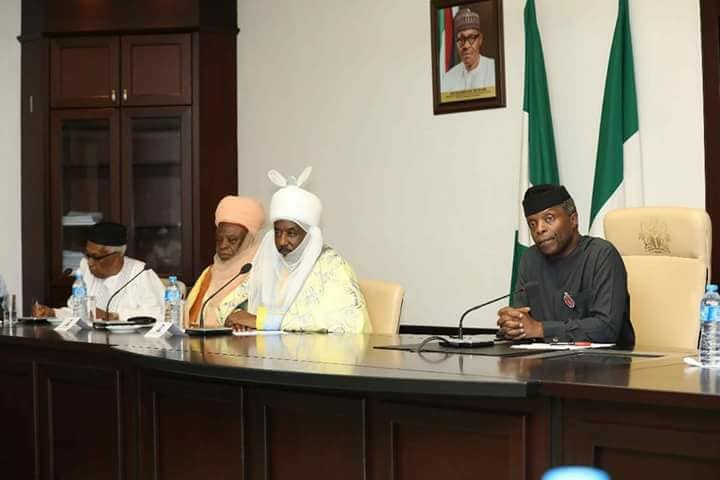 Photos: FG begins national consultation on Farmers-Herders conflict as Osinbajo meets with Emir of Kano, other Northern traditional leaders – Royal Times of Nigeria. Vice President Yemi Osinbajo, SAN, following his visit to Adamawa state on the 5th of December 2017 in the wake of the communal clashes in the area, yesterday, Monday, commenced a series of national consultations with all relevant groups designed to find a lasting solution to the farmers-herders conflict in parts of the country. The first meeting held at the Presidential Villa, Abuja, and had in attendance the Emir of Kano, Muhammadu Sanusi II; the Lamido of Adamawa, Muhammadu Barkindo Aliyu Musdafa; elder statesman, Mallam Ahmed Joda; and other leaders of the Fulani communities. Subsequent meetings would focus on other interest groups. At the meeting, previous reports on the conflict were presented by the delegation and causes of the conflict were analysed. The meeting unequivocally condemned the acts of violence that has occurred, especially the killing of children and women, and highlighted the need for Law Enforcement and other Government Agencies to dutifully and objectively perform their Constitutional roles. The Vice President assured the delegation of the Federal Government’s resolve and commitment to the entrenchment of lasting peace in all communities across the country and the resolution of all legitimate grievances. Already, following the Vice President’s visit to Adamawa State last week, several food items and relief materials have been distributed to all the affected communities in the State, including Shafaron, Kodomti, Tullum, Mzoruwe and Mararraban Bare in Numan Local Government Area. Others communities that have received relief materials are Dong, Lawaru and Kukumso in Demsa Local Government Area of the State. In the next series of meetings, the Vice President will meet with the Batta, Bachama and other groups from Adamawa State; while meetings with stakeholders from other conflict-affected States would follow. Also at the meeting were Secretary to the Government of the Federation (SGF), Boss Mustapha, and the Minister of the Federal Capital Territory, Mohammed Musa Bello.